1. 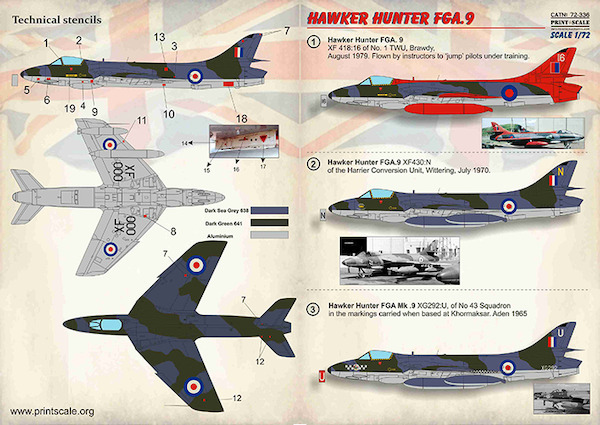 Hawker Hunter FGA.9 XF 418:16 of No. 1 TWU, Brawdy, August 1979. Flown by instructors to 'jump' pilots under training. 2. Hawker Hunter FGA.9 XF430:N of the Harrier Conversion Unit, Wittering, July 1970. 3. Hawker Hunter FGA .9Mk .9 XG292:U, of No 43 Squadron in the markings carried when based at Khormaksar. Aden 1965. 4. Hawker Hunter FGA.9 Mk 9 XG 169 : K, of No. 208 Squadron Sharjah, Persian Gulf, 1968. 5. Hawker Hunter FGA.9 Mk 9 XE 655 : H, of No. 8 Squadron at Khormaksar, Aden. 1961. 6. Hawker Hunter FGA.9 R 1821 of the Rhodesian Air force, Iate 1960s, early 1970s. No wing national insignia.